YOUR GIFT CARD IS WORTH LESS THAN YOU THINK. You'd expect a $100 gift card to be worth $100, the way $100 in cash is worth $100. But it's not. We calculated a gift card's market value by finding out its resale price online. Most gift cards can only be sold for between 50% and 90% of face value. We assessed a gift card's value by figuring out how much you could sell it for in a marketplace. We found that there are big differences among the resale values of various gift cards. For example, a Whole Foods gift card is worth nearly twice as much as a 1-800 Flowers gift card. WHAT'S YOUR GIFT CARD WORTH? While there are some structural reasons for gift cards being worth less than cash, the main reason is that gift cards are more restrictive than cash. They can only be spent at a specific place. As a result, over time gift cards go unused and are lost or forgotten. Then one day five years later, you find them expired in your bedroom drawer. I sure hope Grandma gets me Portal 2 for Christmas this year! Damn. Do they sell videogames at Macy's? You're the best Grandma. Portal 2, here I come! An Abercrombie polo? Doesn't Grandma know I'm a hipster? The chart below represents our findings from looking at the data. Take a look and see if you agree with our conclusions. Each bubble represents a unique gift card or category of gift cards. We've mapped the resale value on the X-axis, and the gift card's overall popularity on the Y-axis. See the sources section for more details. Click the left and right arrows to see different variations of the data. Looking at retail overall, the largest retailers (Costco, Walmart, and Target) have the most valuable gift cards, likely because their size and selection makes them easy to redeem for most anything you'd want. On the other hand, Wisconsin-based Shopko only exists in 13 states, making its gift cards useless for most. Somehow, Best Buy ousted Apple for most valuable electronics gift card, despite being much smaller revenue-wise. Smaller retailers like FYE and Brookstone didn't perform well, as expected given their selection and store footprint are far more limited than Best Buy. Starbucks gift cards are worth $30 more than Coffee Bean gift cards. It may be because the chances that you're in a Starbucks reading this, right now, are higher than the chance that there's a Coffee Bean within 2 miles of you. Jokes aside, there are 30x more Starbucks locations than Coffee Bean locations, and it shows in their true gift card values. A lot of gift cards ended up worth 50-60% of their face value. We know the causes in some of the situations- for example, some were obscure places no one had heard of (Frederick's of Hollywood?). Others, like American Apparel, were surprising until we realized that they've been on the brink of default with a legitimate possibility that the gift cards wouldn’t be honored. Gas and grocery gift cards killed it, while specialty stores like Build-A-Bear, Godiva Chocolate, and the Lego Store, faltered. People visit grocery stores more than weekly, and refuel their cars at least monthly. How often do people pop into their local Build-A-Bear? Beauty gift cards didn't fare well either. A gift card to Bath & Body Works might just be perceived as insulting. Here we've plotted our entire dataset. The correlation between popularity and value is readily apparent here. What observations or patterns do you see? Let us know in the comments. Share with your friends and family using the buttons to your left. If you have a blog, you can copy / paste the below code to share a snippet. Licensed under Creative Commons Attribution-NonCommercial-NoDerivs 3.0 Unported License. GiftRockets are online money gifts, with suggestions of where to spend them. That way, the recipient has ultimate flexibility in how they'd want to use them. You can buy a GiftRocket for any business in the USA, including every retailer mentioned above and millions more local businesses. We determined the market value of a gift card as what you could sell it for on the internet. We compiled data from multiple websites that offer to buy gift cards from people. We measured popularity in a fairly indirect way. Each given gift cards was ascribed a traffic score, based on the Google Keywords tool. We tracked several terms-- for example, for Walmart, we ran the terms "Walmart gift card" and "Wal-Mart gift card" into the tool for exact matches and aggregated the results. The axis you see for popularity is on a log scale (base 10). 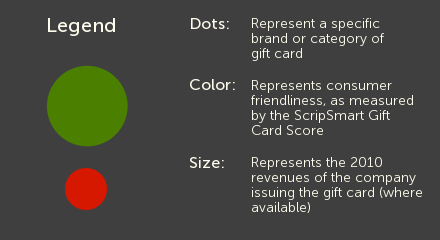 Scripsmart rates different gift cards on their overall friendliness to consumers. A special thanks to ScripSmart for providing us access to their data. Where available, we calculated total revenue for particular gift card issuers. These revenue numbers were 2010 full year, and taken from Wikipedia and annual SEC filings. For some conglomerates we were not able to get brand-level data on sales- in those cases, we took the parent company's retail sales and used a proportion based on their store count. In the coffee panel, we weren't actually able to find revenues for the smaller companies. We used # of US retail locations as a proxy. Note that all relative sizes of bubbles are on a log basis. So a bubble that looks 2x as big as another represents a 10x difference in company size.